The TUM physicists Alexander Holleitner and Reinhard Kienberger succeeded in generating electric pulses in the frequency range up to 10 terahertz using tiny, so-called plasmonic antennas and running them over a chip. Researchers call antennas plasmonic if their shape amplifies the light intensity at the metal surfaces. The asymmetrical shape of the antennas is important. One side of the nanometer-sized metal structures is more pointed than the other. When a lens-focused laser pulse excites the antennas, they emit more electrons on their pointed side than on the opposite flat ones. An electric current flows between the contacts—but only as long as the antennas are excited with the laser light. "In photoemission, the light pulse causes electrons to be emitted from the metal into the vacuum," explains Christoph Karnetzky, lead author of the Nature study. "All the lighting effects are stronger on the sharp side, including the photoemission that we use to generate a small amount of current." The light pulses lasted only a few femtoseconds. The electrical pulses in the antennas were correspondingly short. 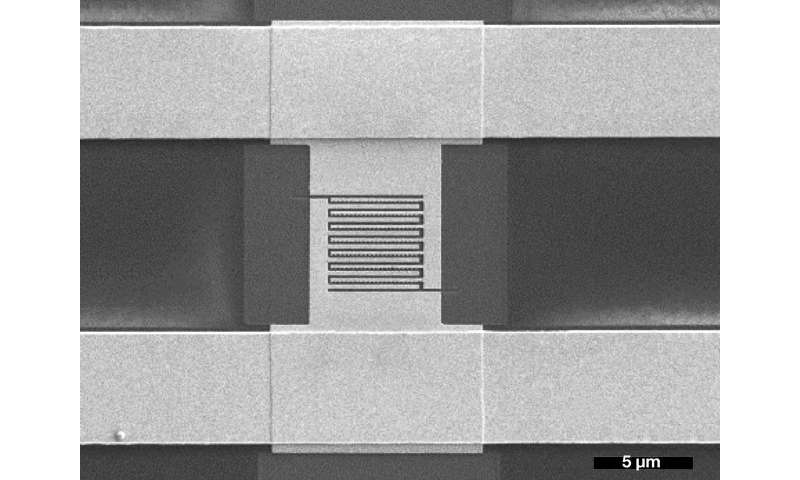 Technically, the structure is interesting because the nano-antennas can be integrated into terahertz circuits a mere several millimeters across. 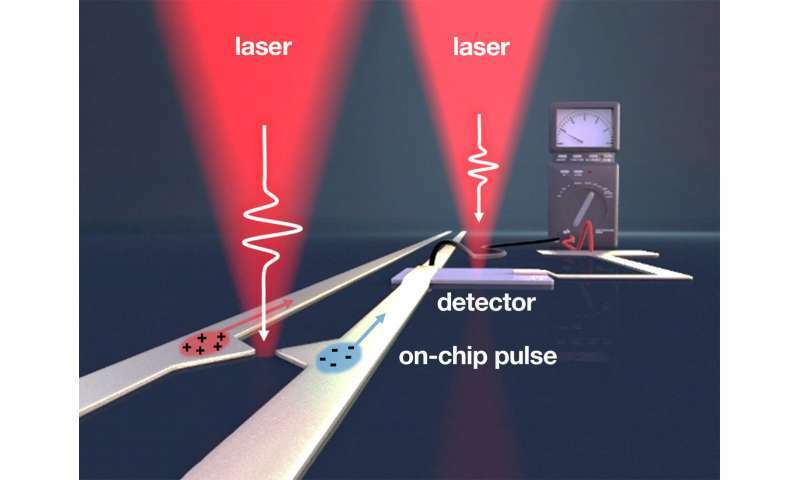 In this way, a femtosecond laser pulse with a frequency of 200 terahertz could generate an ultra-short terahertz signal with a frequency of up to 10 terahertz in the circuits on the chip, according to Karnetzky. The researchers used sapphire as the chip material because it cannot be stimulated optically and, thus causes no interference. With an eye on future applications, they used 1.5-micron wavelength lasers deployed in traditional internet fiber-optic cables. Holleitner and his colleagues made yet another amazing discovery: Both the electrical and the terahertz pulses were non-linearly dependent on the excitation power of the laser. This indicates that the photoemission in the antennas is triggered by the absorption of multiple photons per light pulse.